The Middletown Insider: Should Politics Be the Focus of the American Life? 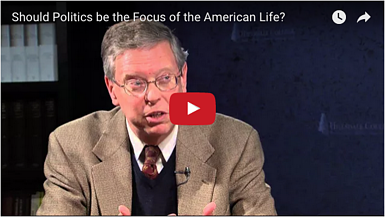 Should Politics Be the Focus of the American Life? According to professor Paul A. Rahe, the focus of the ancient Greek citizen’s life was political, while the oikonomia, which translates roughly as “economy” or “household life,” was of secondary importance. This reveals a different perspective on what makes for a good life than the one we have today. In modern America, the private life—commerce, family, faith—is the ultimate good. Professor Rahe explains how this is sustainable because our society is driven by commerce rather than war. Watch this short video with Dr. Rahe to learn more. The video is a clip from Hillsdale’s Online Course: “Western Heritage,” featuring Paul A. Rahe, the Charles O. Lee and Louise K. Lee professor in the Western Heritage, and John J. Miller, director of the Dow Journalism Program. Hillsdale's free online course, "Western Heritage," focuses on key aspects of the beginning of Western civilization and its Greco-Roman and Judeo-Christian heritage. Register for "Western Heritage" today by Clicking Here.